Several turtle species make good pets, but the best captives share several key traits. They are typically small, hardy animals whose dispositions, dietary preferences and behavioral patterns are suitable for captivity. Fortunately, you can choose from a number of species that fit these criteria, including aquatic, semi-aquatic and strictly terrestrial forms. Beginners are wise to stick to those species that regularly breed in captivity, as captive-bred individuals make better pets than their wild-caught counterparts do. Aquatic turtles often make interesting captives, but providing a suitable habitat for them is costly and requires significant amounts of space. However, a few species, notably the mud (Kinosternon spp.) and musk (Sternotherus spp.) turtles, typically reach about 4 or 5 inches in size. You will need a 50- to 60-gallon aquarium to house a pair or trio -- and this is only about one-third the size of the tank you would need to keep a similar colony of slider (Trachemys spp.) turtles. Mud and musk turtles are largely carnivorous, but most of them readily accept commercial pellets, making it simple to feed them. Box (Terrapene spp.) and spotted turtles (Clemmys guttata) are relatively small chelonians who rarely grow longer than about 5 inches. Both are omnivores who primarily consume insects and other small creatures. Both species need a large land area composed of substrate the turtles can dig in, and both species fare best when provided a large, shallow water area. The turtles are sure to defecate in the water, so you must use a filter mechanism or change the water daily. Terrestrial species require only a small water dish, which makes them some of the easiest turtles to house. Unfortunately, most terrestrial species reach rather large sizes. However, Russian (Testudo horsfieldi) and Greek tortoises (Testudo graeca) remain relatively small. While the largest individuals of both species may reach about 9 or 10 inches in length, most will be much smaller. Both species thrive best when kept outdoors in areas of suitable climate. Russian tortoises are from the Asian steppe region, which is somewhat like the dry continental climate of the interior United States, while Greek tortoises live in regions with Mediterranean climates much like that of coastal California. Some species that would otherwise make excellent pets have an undesirable trait or two. For example, many pond sliders (Trachemys scripta) and painted turtles (Chrysemys picta) would make great pets were it not for their large adult size. However, for those with adequate space and resources, they may be a viable option. 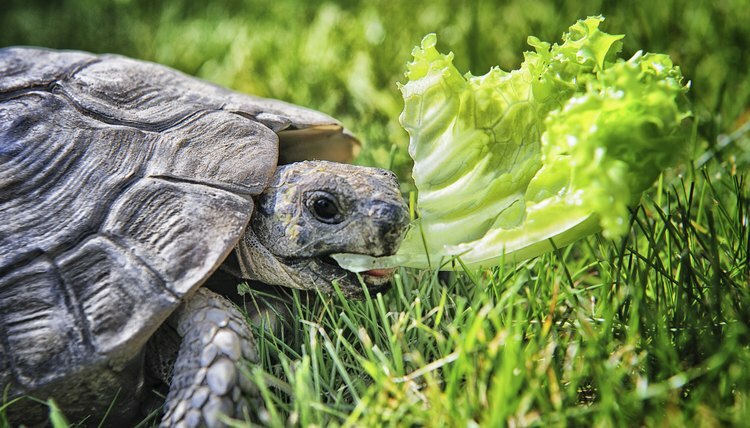 Similarly, African spur-thighed tortoises (Geochelone sulcata) are hardy, personable tortoises -- but, as the third largest land-dwelling turtles in the world, they are suitable pets only for those with incredible amounts of space and the resources to feed such large animals. Former zookeeper Frank Indiviglio contends that Chinese big-headed turtles (Platysternon megacephalum) make good captives, although they often take more effort to locate than many other species do. The turtles’ large heads may also be intimidating to new keepers. Wood turtles (Clemmys insculpta) have endearing personalities, but they grow to about 10 inches and so require rather large cages. Additionally, they receive legal protection in many states, making it difficult to obtain legal specimens. What Kind of Turtles Stay Small?